Each of the four Gospels has its own unique traits, its own perspective on the life of Jesus. When we look at the Gospel of Luke, for example, we see a clear stress on Jesus as the Son of Man, but there is another, often less noticed, aspect of Luke’s Gospel that can be illuminating: its focus on prayer. Prayer appears throughout the four Gospels, of course, but there is a noticeable stress on it in Luke’s writing. 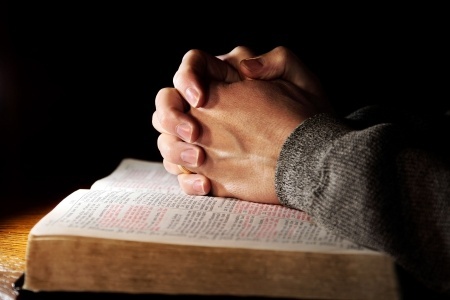 While prayer is mentioned – depending on the translation – around 14 times in matthew, 12 times in Mark, and 6 times in John, in Luke prayer appears on some 26 occasions. Luke notices prayer, he comments on it, puts it in context, and ultimately, uses it as a framework for his Gospel. The evangelist begins his account of the life of Jesus, not with the Messiah’s birth, but with the prayer that preceded it. He tells us that it was as the devout people of Jerusalem were praying in the temple (Luke 1:10) that an angel appeared to the priest Zechariah to inform him of the coming birth of his son – John the Baptist – who would prepare the way for the Messiah (Luke 1:17). In the same way, Luke closes his Gospel, not with Christ’s ascension, but with the fact that it was followed by the disciples returning to pray and worship in the Temple, where his Gospel’s prayer-focused narrative began (Luke 24:53). Between these starting and ending points, as Luke recounts the life and ministry of Jesus, he weaves into his narrative continued references to prayer – and especially the prayers of Jesus himself. In fact, Luke tells us more about the prayer life of Jesus than any other New Testament writer. While Mark only mentions the prayer of Jesus three times, Luke does so continually. To read the Gospel of Luke is to hear Jesus praying just as much as it is to hear him teaching the crowds. Only Luke tells us that Jesus prayed continually (Luke 5:16), and Luke includes seven accounts of Jesus praying that are not found in any of the other Gospels. (Luke 3:21; 5:16; 6:12; 9:18, 28–29; 11:1, 22:32–46. While the other Synoptic Gospels mention Jesus praying in two of these instances – 5:16 and 22:32-46 – Luke gives unique material in both cases). Luke tells us that Jesus was praying when the Holy Spirit descended upon him at the beginning of his public ministry (Luke 3:21). It is Luke who tells us that Christ spent the whole night in prayer before he chose his twelve disciples (Luke 6:12), and only Luke gives us the added details that when Jesus took his closest disciples – James, Peter, and John – up the mountain to allow them to see him transfigured as he would be in the Kingdom of God, he first ascended the hill to pray (Luke 9:28), and the three disciples experienced Jesus’ private prayer before they witnessed his transfiguration (Luke 9:29). The third Gospel makes it clear that Jesus often prayed in the presence of his disciples and that he taught them how to pray not only by his example (Luke 9:18), but also by giving them the prayer outline we call “The Lord’s Prayer” (Luke 11:1-4) and a number of parables on prayer. These parables are gems of instruction that teach us not to lose heart and to pray with shameless persistence (Luke 11:5-8, 18:1-8) as well as stressing the attitude we should have in approaching God (Luke 18:9-14). In these ways and in others (Luke 6:28, 10:2, 22:40, 46, etc. ), Luke shows Jesus constantly urged his disciples to pray. In Luke we continually catch sight of the importance of prayer in Jesus’ own life and work. We see him praying in every circumstance, from formal blessings (Luke 9:16) to informal and spontaneous expressions of joy (Luke 10:21). We see that he prayed before important events, and also after them – apparently especially after performing miracles (Luke 5:15-16). Jesus often withdrew at such times, Luke says, to lonely places and prayed (vs. 16). By the time we come to the end of Jesus’ ministry, there can be no doubt in our minds, if we are attuned to Luke’s message, that it is through prayer that Jesus performed his works – not through his own strength (John 5:19, 30), but through a close relationship with God based on ongoing empowering prayer. As we reach the end of Jesus’ life, we see His agonizing prayer in the Garden of Gethsemane (Luke 22:39-46) not as a unique situation, but as yet another example of Jesus’ regular reliance on prayer, expressed at a crucial moment in his life. Luke gives us details of the Gethsemane prayer of Jesus no one else records – such as the fact that “…his sweat was like drops of blood falling to the ground” (vs. 44), and it is typical that although all the Gospel writers tell us that Jesus returned from praying and found his followers sleeping, only Luke records that Jesus urged the disciples “Get up and pray” (vs. 46). At the Cross, Luke alone records Jesus’ words: “Father, forgive them, for they know not what they do” (Luke 23:34 ESV), words that would become the creed and archetypal example of Christian forgiveness – a prayer so radical and vital to Christianity that it is amazing that it appears only in this one Gospel. And in the same way, Luke alone lets us hear Jesus’ final prayer: “Father, into your hands I commit my spirit” (Luke 23:46). It should not surprise us, then, that when Luke tells the post-resurrection story of the disciples who met Jesus on the road to Emmaus, he provides a detail that we might easily miss, but one that is of clear significance: even though those disciples apparently walked and talked with the risen Jesus for hours, it was only when he prayed that they recognized him (Luke 24:13-31). Perhaps, by analogy, we can say it is to the degree that we follow the examples and teachings of Christ in the “Gospel according to prayer” others will recognize the Son of Man in us also. * You can learn more about the unique perspectives of the Gospels in our free book Inside the Four Gospels available on our E-Books page.